Construction sites require a flexible approach that allows the introduction and inclusion of new building techniques. Here at 4More Space, we understand the ever-changing landscapes of these construction sites. We emphasise practical experience and solutions that incorporate old and new, ensuring that your construction goes as smoothly as possible. In particular, we specialise in modular and portable buildings. 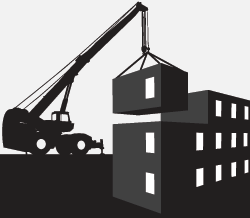 Our modular building installers know how to properly set up and articulate projects from start to completion. We have more than 20 years of experience installing these buildings and have made major personal investments in ensuring the safety of all systems. When it comes to your portable building installations, trust the company that made a name for itself ensuring the successful completion of our projects. Working from the feedback we receive from our clients, we have installed major projects across the UK Nationwide including those that have ranged from as little as 2 to as many as 200 modular bays. As no job is too big or too small, we rely instead on our experience to make sure that we deliver the right environment for your project. We are also experts at connecting services such as mains and temporary electricity, water and fowl supplies, providing you will a full range of necessary services required. Our motto is “Large enough to provide any size project whilst being small enough to make it personal” experience for yourself what it is like to have the best modular building installers working for you. Establishing a working relationship and being by your side every step of the way, we strive to ensure the continued quality of every job we provide assistance for. It is our hope at 4More Space that our services will help you not only realise your construction objectives. We hope to make your project cost effective, saving you time and money, and more importantly reducing any hassle than if you chose to go elsewhere. If you are looking for installation services call us now on 0870 803 1965 or alternatively through our contact page.